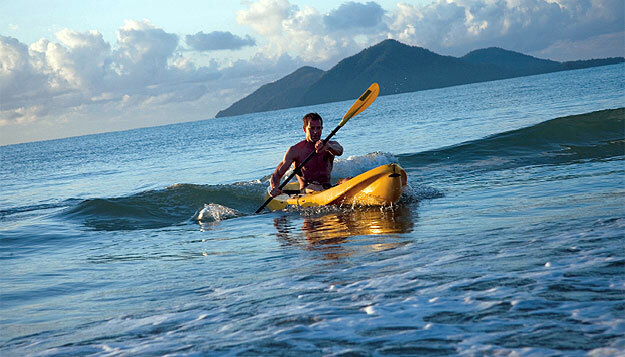 Unwind in the waters of Mission Beach's 14km stretch. Image by Darren Jew Tourism Qld. The biggest fear that Mission Beach locals have is “being turned into another Port Douglas”. Such a threat only serves to highlight just how good the locals have it. Walking the long stretches of Mission Beach sand, gazing outwards to the resort islands (family fun Dunk and exclusive wealthy retreat Bedarra) and inwards to the rolling green rainforest as it meet the sea, it’s hard to let the pressures of modern life sneak into consciousness. A sleepy tropical beach town with a lifestyle many stressed city slickers yearn for, and many youngsters probably don’t know is possible, Mission Beach stretches about 14km from superb Garners Beach in the north to South Mission Beach, well in the south. The name Mission Beach was commonly used in the early 20th Century for many of the coastal hamlets where Aboriginals were herded “for their own good”, yet the name stuck here. It can back up its idyllic holiday claim with loads of things to do and see, from skydiving, snorkelling, canoeing and generally lazing around. Holiday homes of all levels are aplenty (with Altitude One 40 being the latest in a very exclusive set), as are quality and fairly priced resorts, like the recently refurbished Elandra. As a carefully guarded piece of paradise with idyllic beaches, relaxed and warm days, Mission Beach is a reminder of what life can be. Where? // 140km (2hrs 10mins) south of Cairns. Did you know? // Despite the religious-sounding name, the original Mission Beach was not sanctified in any way but more akin to a penal settlement. I think you will find the time to travel from Cairns to Mission Beach is only about an hour and a half. That is if you drive straight there, but you probably stopped for an hour in Innisfail for a coffee and a rest break.